Traditional nursery decor tends to be a gently stirred mix of cute animals, soft hues and nicely matched furnishings. And there’s much to be said for all that sweet serenity; these are rooms both peaceful and soothing. But many parents and designers are looking to inject nurseries with a quirkier style sense, creating spaces that encourage creativity and individuality. Some want the nursery’s decor to echo the decor in the rest of the home, and to have some longevity beyond the baby years. These days, a baby’s room might include global elements, like Moroccan rugs and poufs; carved wooden mirrors; French light fixtures; Indian tables or wall hangings. Handmade touches might include throws, baskets, artwork or garlands made by relatives, friends or a talented Etsy.com artist. 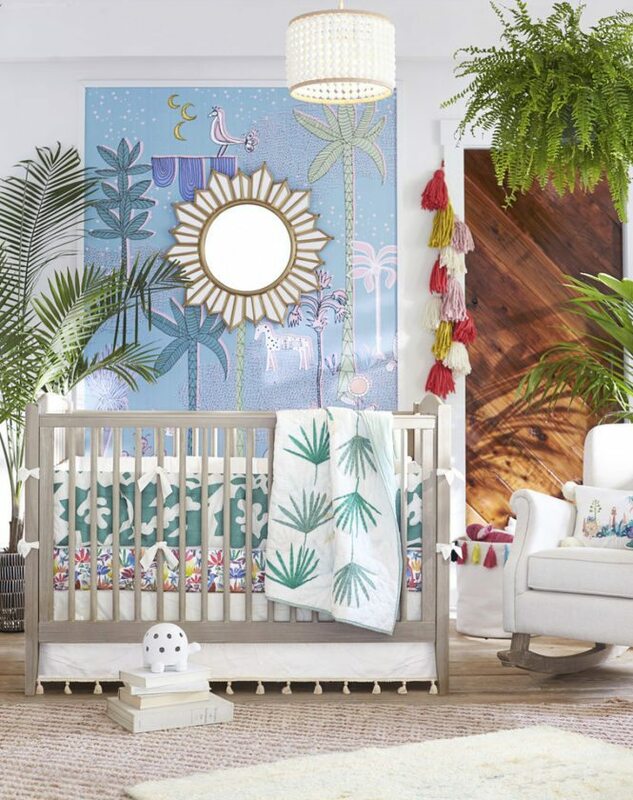 Boho nurseries tend to include imaginative prints and patterns, and the palette can range from neutral-with-a-twist to an all-out celebration of color. Eclectic, energetic and enchanting, boho nurseries are fun to decorate, and can be a visual feast for young children. Los Angeles-based Justina Blakeney is an artist, designer and founder of the blog The Jungalow. Her latest book, “The New Bohemians Handbook” (Abrams, October 2017), gives readers painting, decorating and lifestyle tips. Blakeney advises taking an exuberant, upbeat approach, creating a child’s room that’s full of color, pattern and (non-toxic) plants. She’s just done a collection with Pottery Barn Kids that includes toy organizers, soft, plushy rugs, and a stick-on wallpaper called Jungalino. “I also love to include things like disco balls, crystals and glow-in-the-dark elements that add sparkles, rainbows and magic to a room,” she says. Many mainstream retailers and smaller design studios are on the boho nursery trend. Wallpaper is one quick way to amp up the sense of adventure in a nursery. Graham & Brown has a black-and-white illustrated London cityscape that would keep little minds busy exploring, while Anthropologie has Voutsa studio’s Garden Chinoiserie wall mural, full of hand-painted, oversize exotic birds, flowers and vines. Sydney Penner, an artist in Vancouver, British Columbia, with the Etsy site AneWallDecor, does moody murals of winter woods and forest creatures that might appeal to all ages. And handcrafted elements can add charm and authenticity to a boho nursery. West Elm’s got a collection of decorative mirrors made by Peruvian artisans that were inspired by the intricate carpentry in old colonial homes. Los Angeles artist Kim Baise sculpts mini versions of objects like ukuleles, fruit, birds and cowboy boots out of papier mache, and strings them into playful mobiles. Also at West Elm: pretty snowglobes with colorful birds or cactus perched among the sparkles. Interior designer and HGTV contributor Erica Reitman suggests adding kilim or faux sheepskin rugs, tribal textiles, abstract art and braided baskets. “Larger baskets can hold toys or extra blankets, and smaller baskets can store extra diapers or burp cloths,” she says. Design studio Ace & Jig has a vibrant collection at Land of Nod that’s based on antique textile patterns. A hand-tufted Indian and New Zealand wool rug features a bold, blue-and-white geometric motif. Toddler bedding comes in a black-and-white Southwestern pattern. And there’s a style-savvy patchwork mat and tepee for play time.